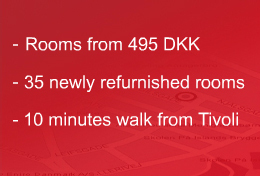 Are you visiting Copenhagen in business or pleasure and in need of convenient accommodation? Leave the buzz of busy Copenhagen behind you after a day of fun at Tivoli Gardens and take a short 10 minute stroll over to the popular area called Islands Brygge. Feel the comfort of having the heart of Copenhagen on the other side of the canal yet resting your head in a quiet and calm family friendly area. Having the metro-line only 400 meters away from the hotel makes the location ideal for people wanting to go to the business hub Ørestad, the airport or the shopping street Strøget in no more than 5 minutes. The metro line runs all night so you can be sure to get to your location on time. Let the decision of choosing either a room with shared facilities, an apartment with fully equipped kitchen or the 130 square meter suite with 2 bedrooms depend on your individual purpose of your stay in inspiring Copenhagen. Hotel Copenhagen's breakfast will set you off on a good start. Everyone has heard of the Danish rye bread and of course, our bread at the breakfast buffet comes straight from the typical old Danish bakery – freshly made every day! Hotel Copenhagen is privately owned and we make sure your stay is easy, convenient and personal no matter what goal you have in Copenhagen.